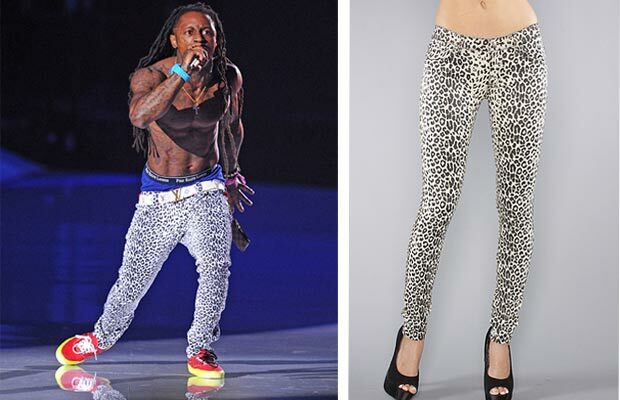 Thought Jeans Couldn’t Get Any Tighter?| Lil Wayne Wears Women’s Jeggings! We saw quite a few “eyebrow raising” outfits at the VMAs this past weekend. But what about the animal kingdom pants that Lil Wayne wore in his performance during the VMAs?! The rapper is known to take a few leaps and bounds in his style – but I was shocked to know that the cheetah print jeans he was wearing were ACTUALLY women’s jegging! Of course he got them a few sizes too big to look more like a traditional skinny jean – but these “leg suckers” by Tripp NYC were good for a one-time wear, retailing at only $44! So if your into dressing like Wayne this won’t be an expensive purchase …however…just be prepared for the stares!